Homing pigeons are finding their way around Britain by following roads and railways, zoologists claim. They say the birds' natural magnetic and solar compasses are often less important than their knowledge of human transport routes. A 10-year Oxford University study discovered some pigeons turn off at certain motorway junctions and use landmarks to remember where they are. The scientists behind the study were "knocked sideways" by their findings. The pigeons' routes were mapped to within four yards by tiny tracking devices and global positioning system technology. Research team member Dr Tim Guilford said the results were "plain to see". "They don't follow linear lines all the time and sometimes when they're flying at 200 or 300ft above built-up areas it's difficult to see exactly what they are following. "But when they do follow a road, it's so obvious. "We followed some which flew up the Oxford bypass and even turned off at particular junctions. It's very human-like." 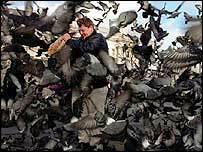 Dr Guilford said pigeons' used their ability to navigate by the Sun when they were over unfamiliar territory. He said they did not always fly "as the crow" - making diversions to follow roads home when there were more straightforward routes. "That's the exciting thing, because we knew then there was something more important to them than just saving energy." The team believes the birds use the technique to keep their journeys as simple as possible. "People used to think pigeons navigated by the sun, the moon and the stars"